Homemade Pizza is tasty and cheap. Tool up with these must-have pizza tools so that pizza night comes together easily. Pizza Night has been a Friday night tradition at our house for about 18 years. It took some trial and error at first and some coaching from my friend Jessika. But, over time I’ve found some really great methods and tools that help me make pizza night easy. Like things can work like clock work around here on Fridays without a huge mess. 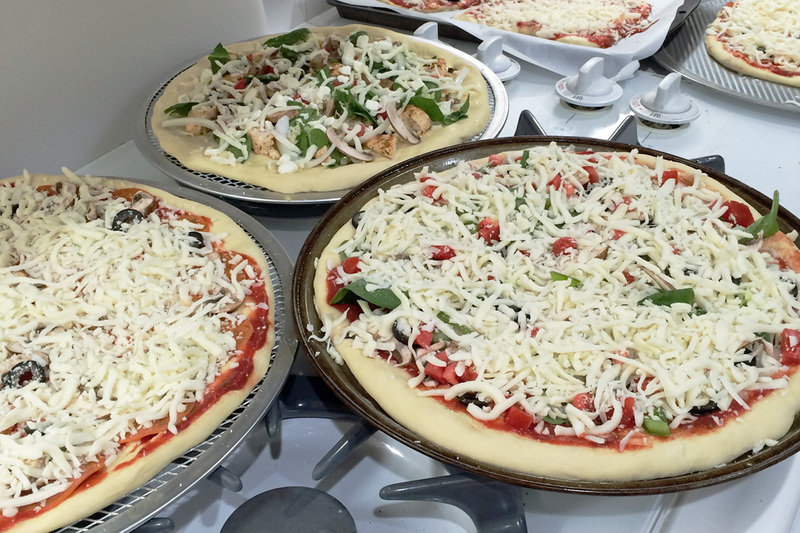 Well, as little of a mess as eight pizzas can minimally make. We’re currently up to a double batch of pizza dough each week so it is a production. 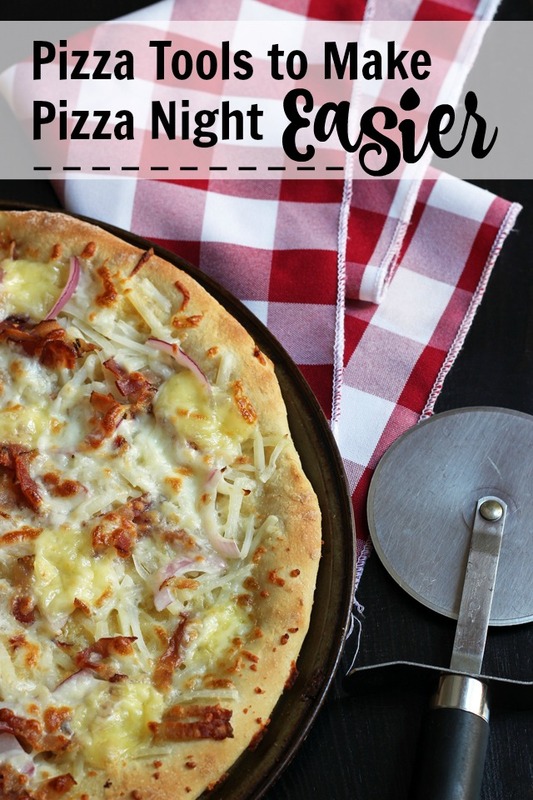 So that you can make your pizza nights easy, I thought I would share the tools and methods that are currently working well for me. A kitchen scale – I use a kitchen scale to weigh flour these days. It’s super easy to put a bowl on the scale, zero it out, and start scooping flour into the bowl. I only have to do one math problem instead of remembering how many cups I put in. I’ve had this model kitchen scale six years and it’s performed wonderfully. The batteries it came with last five years! A KitchenAid mixer – In the old days, like 2014 and earlier, I used a bread machine to make the dough. I loved that I could throw in the ingredients and walk away. After going through three or four of this model bread machine — the last one died last year — I decided that was enough. I’d either need to invest in a better appliance or make do with the appliance I already had: my KitchenAid mixer. Now the reason I liked using the bread machine all those years was mainly for the nonstick bread pan. It was super easy to clean up. I was worried that would be an issue with the Kitchenaid. And that by moving the dough to a greased bowl, I’d have not one but two bowls to clean! Once I’ve got my dough all nice and beautiful, I grease the Kitchenaid bowl with nonstick cooking spray and let the dough rise in the bowl I mixed it in. Yay! It cleans up almost as easily as the bread machine. A large plastic cutting board – I use a large plastic cutting board to work my dough on. Once all the pies are prepared, I dust off the board and use it for cutting the pizzas. I’ve experimented with a lot of different pizza pans. I have a variety of different styles, sizes and shapes. I don’t have time to mess with pizza stones and pizza peels, so I prefer to make the pizzas on pans that can go in and out of the oven in turns. Round pizza screens – My favorites are probably these pizza screens. There are a number of sizes. I’ve found them to be a great investment. I spray them with cooking spray (over the sink) and they come clean every time. Round perforated pizza pans – I have two that I bought 15 years ago at Walmart. I can’t find a link online, but these look similar. They’ve worked really well and were my favorites until I found the screens. I have a USA pan, as well, but while I like all the other USA pans I’ve bought, I don’t love the pizza one. It doesn’t allow as high a heat as I like to bake my crust so the dough is not as crisp when it comes out of the oven. I think it’s also more insulated so the crust has a slightly different texture. When I’ve exhausted my favorite pans, I still use the USA pan at a lower heat and then use parchment on a regular baking sheet for the rest of our pizzas. Apparently, Santa needs to bring me some more pizza screens. 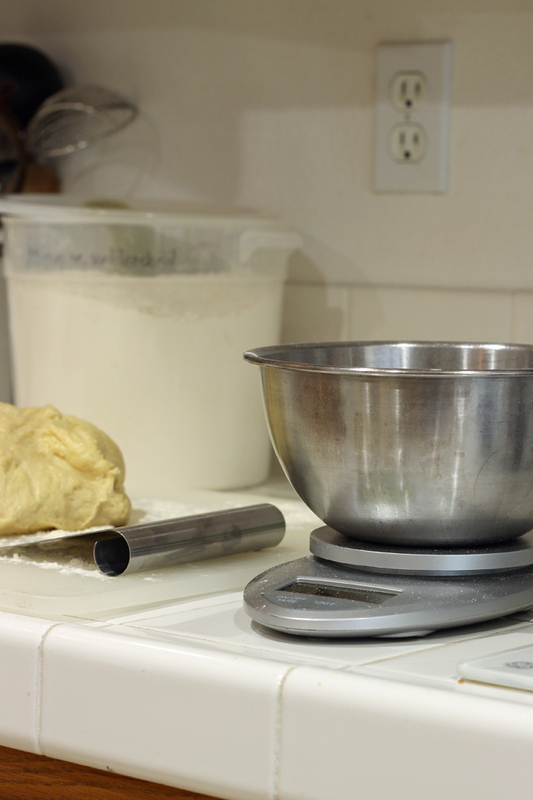 A pizza wheel – I have a Pampered Chef pizza wheel that has lasted me about ten years. I love it! No complaints there. Pizza night is a lot of fun. It’s the thing that everyone most looks forward to at the end of the week. 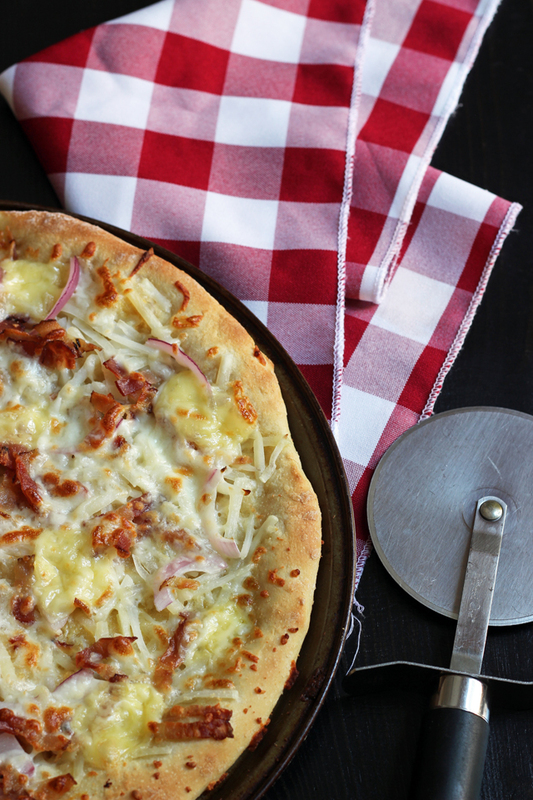 Having the right pizza tools can make it fun and easy. What are your favorite pizza tools? I love the cast iron pizza pans from Lodge. They are my very favorite. I love your blog and read regularly, first time commenting, though. Thanks for all you do! funny you mention, not having the time to mess w/ a pizza stone…………that is the only thing we use for our pizzas 🙂 to me its not a problem only takes a minute or less to clean after is been seasoned well, & not long before 🙂 love mine but never had anything else. Haha! Well, when I read how you weren’t supposed to form the pizza ON the stone, it was a deal breaker for me. Since we go through 8 pizzas a night, that’s a lot of moving from counter to stone. That’s why I never used the stone I received years ago–I didn’t have a way to get the pizza onto the heated stone. I’d imagine if I cooked it that way I’d be happier with the crust, but I really don’t have a place to store a peel and the stone was too small for anything other than a small/medium pizza, so it never happened. Maybe someday when I get that super big kitchen with oodles of storage? The pizza screens give it a really crisp crust because the dough has access to the heat. Perhaps not exactly the same as a stone, but great texture. A dear friend just sent me a new fantastic Kitchen Aid Stand Mixer. I am in heaven! Cannot wait to use it to make those wonderful breads and pizza dough. We have a pizza stone we love to use. Now to find a good recipe for both! How do you get the pizza onto the screen? We also have a Friday pizza traditions, so we make it often, but we always pat the dough out onto the pan. Seems like that wouldn’t work with the screen? Do you form the crust on the counter, then flip it onto the screen somehow, like you see in movies? I’d really like to try the screens (using your link, of course 😉 ), but can’t wrap my head around how you get the dough there without a peel (which I don’t have or want). I am also curious about the pizza screen. What do you do with it? I place the formed dough on the screen and then top it and bake. https://youtu.be/xMXydSWIg2M shows how I form the dough. Oh! I understand. lol. It’s a baking pan for the pizza. I thought maybe it went on top of the pan. LOL. I think I may need to order the pizza screens. It is $4 each for the 4 pack. I have the very sam Pampered Chef pizza cutter. And have had it forever! I LOVE IT!! We use it all the time, for pizza, quesadillas, whatever. Can I ask what sauce recipe you use on your pizza’s the most? I have your freezer cookbook and see the recipe for the red sauce, but I also see the pizza sauce recipe. Which is the one that you use the most? I finally got one of the pizza screen pans like you have in this post… and wow, it’s a game changer! I’m ordering 2 more! Perfect crispy crust! Thanks for the heads up! So glad it’s working for you!